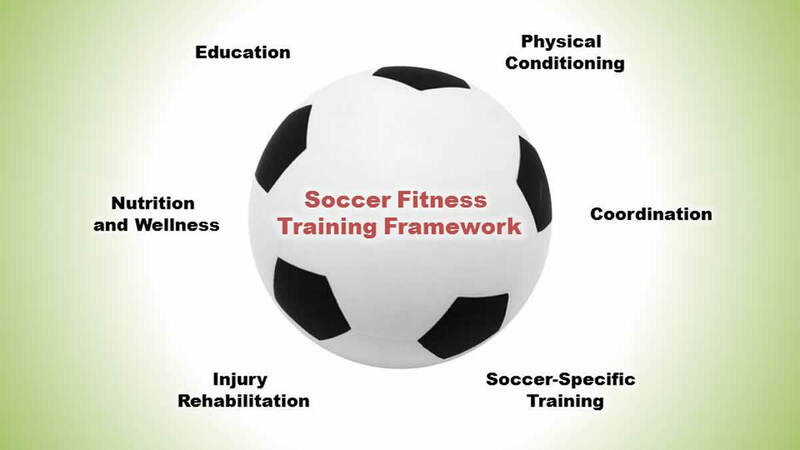 The Soccer Fitness Training Framework explains the six necessary components required for successful and long-term improvements in soccer-specific physical fitness. Training for the aerobic, anaerobic lactic, and anaerobic alactic systems, done using movements, intensity, and work-rest periods similar to those used in the sport of soccer. Strength, speed, power, and plyometric exercises, targeting soccer-specific muscles, are executed using the maximum amount of force, in the minimum amount of time, in order to maximize players’ physical performance. Soccer-specific movements and muscular recruitment patterns are taught, and reinforced, to ensure that players develop more efficient movement mechanics, and are able to train and play at higher intensities without wasting energy. Rehabilitation and prevention of acute and chronic injuries to specific areas (low back, hips, groin, knees, ankles, and shoulders) is achieved through targeted strength exercises, utilizing various different speeds of contraction and types of resistance. Athletes are provided with current information and tools needed to help them adopt a healthy, active lifestyle, including an athletic diet designed to maximize performance, while also taking into account specific needs for weight loss, gain, or maintenance. Teaching soccer coaches with an interest in fitness, and fitness coaches with an interest in soccer, about soccer-specific fitness testing, training, and sports science support.